“Virginia is for Lovers” is the great state’s slogan, and it is true: Overall, it seems romantic, beautiful, charming, open and welcoming. But Virginia has something for everyone and in every part of the state. Go inland and head to Shenandoah National Park, Monticello or Roanoke. Follow the line of famous cities Alexandria, Fredricksburg or Richmond down the middle of the state for scenic drives or political inspiration. Or find your way to more coastal towns like Norfolk, Chesapeake and Virginia Beach. More than just for lovers, Virginia caters to nature lovers, history buffs, intellectuals and easy-going folks who just like a slower pace. We know that we would return again to explore all that Virginia has to offer. However, in keeping with our two general guidelines of staying warm and by the water on this tiny living journey, we decided that Williamsburg should be our next stop for beating the cold of the north. 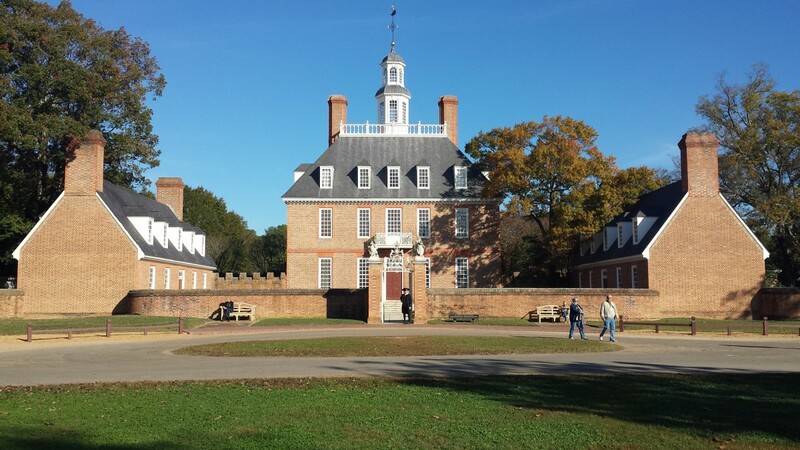 Dripping with history that even our six-year-old comprehended, Williamsburg, Virginia, was a great entry point into the great, mysterious, enchanting, complex American Southeast. Characteristics of and driving forces behind our little traveling trio include considering what the other really likes, how the other learns and interprets information. 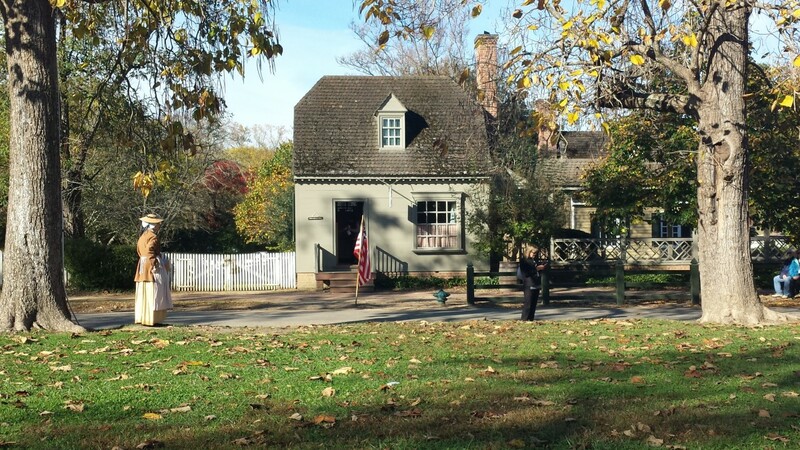 In choosing Williamsburg as a destination, I knew that it appealed to me historically. I had always wanted to visit Virginia and was very familiar with the region’s famed places — Colonial Williamsburg, Jamestown, Chesepeake Bay, Chickahominy River and, of course, the College of William & Mary. I also knew that Scot hated History in school; it was boring to him, lacking tangibility. I suspected that Colonial Williamsburg would create a new opportunity for history to sink in on his terms. And, despite how off-putting it may be to some, Luna was familiar with Jamestown, English settlers and the Powhatan Indians because of Disney’s Pocahontas. Story is tool and experience is living. I’ll take them both if it means that my family will be inspired and understanding. Williamsburg, Virginia, dished up all of it. Founded in 1632, Williamsburg — or Middle Plantation as it was called then — was a fortified settlement built on high ground on the peninsula between the James River to the south and the York River to the north. From 1699 to 1780, Williamsburg was the capital of the Colony of Virginia and the epicenter of political activity leading up to the American Revolution. Jamestown was the original capital, but burned during Bacon’s Rebellion in 1676. Temporary digs were created in drier and more mosquito-free Williamsburg, a decision that stuck with the House of Burgesses (the first democratically-elected legislative body in the British Colonies, aka America, for those who may not remember), making Williamsburg the capital. A failed canal attempt reduced Williamsburg’s chances of remaining the capital of Virginia, and the move to Richmond during the American Revolution solidified its fate. 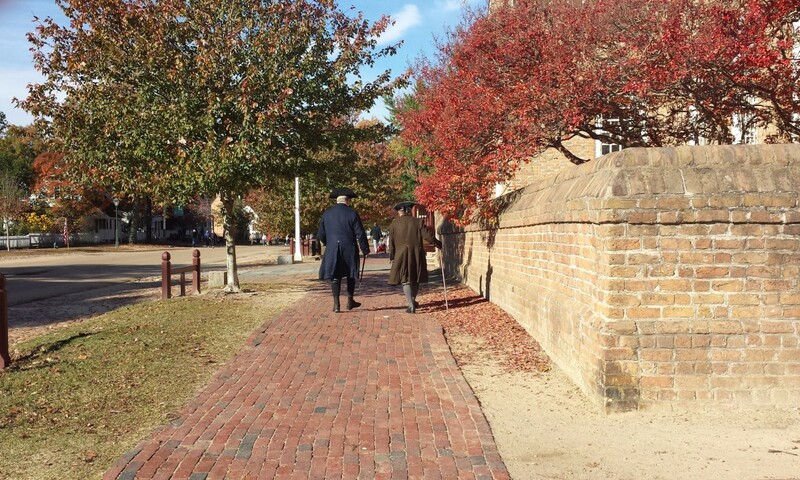 However, Williamsburg was a key player in the events leading to the war with the famed gunpowder incident, a reenactment I happened upon during a morning stroll through Colonial Williamsburg. One other important fact about early colonists of WIlliamsburg was their desire to establish a place of higher learning. The College of William & Mary, named after the monarchs of the time, was established in 1693. 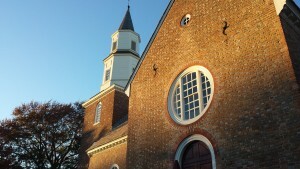 It is the second-oldest university in the U.S. and played a significant role in the revival of Williamsburg. The College of William & Mary is adjacent to Colonial Williamsburg, making this setting unique and bustling and vital to modern Williamsburg. Students jog, actors portray and tourists stroll down the its famous main drag, the Duke of Gloucester (aka the “DoG”), all of the time, at any given time. In Colonial Williamsburg, a rendition of a political debate could be happening in the square, while fans and alum tailgate across the street for a William & Mary Tribe football game. It is illuminating and energizing to hang out in downtown Williamsburg surrounded by so much interesting activity. But make no mistake: What really makes Williamsburg thrive are the tourists, who come to visit the Historic Triangle of Virginia — Jamestown, Yorktown and Colonial Williamsburg. It is well worth the visit. Colonial Williamsburg is the world’s largest living-history museum and a private foundation dedicated to the preservation and reenactment of the origins of the idea of America in this colonial American city. What makes Colonial Williamsburg unique is that anyone can walk through the three-hundred-plus acres of buildings, gardens, squares and open spaces free of charge at any time, often encountering real live, fully-costumed interpreters debating colonial issues, working in taverns or making wigs, or walking down the street. Tickets are required for entrance into buildings or galleries, which in turn support the foundation’s efforts. However, one can easily become immersed as a colonist just by strolling down the DoG or any of the side streets along the way. We were fortunate to find a family-owned campground in the middle of Williamsburg whose owners have something to say about it. 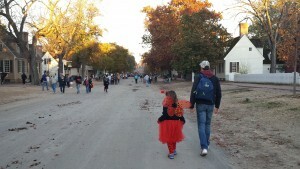 The history of Anvil Campground goes back to 1954. The grandfather and great grandfather of this family were blacksmiths, who helped restore Williamsburg with their iron works, thus the symbol of the anvil was born. Small, quaint and equipped with swings, a pool (closed for the season) and an air hockey table, all of us were content on site. We were truly close to everything — including the mostly gently rolling train and tracks — making our navigation easy and fun. 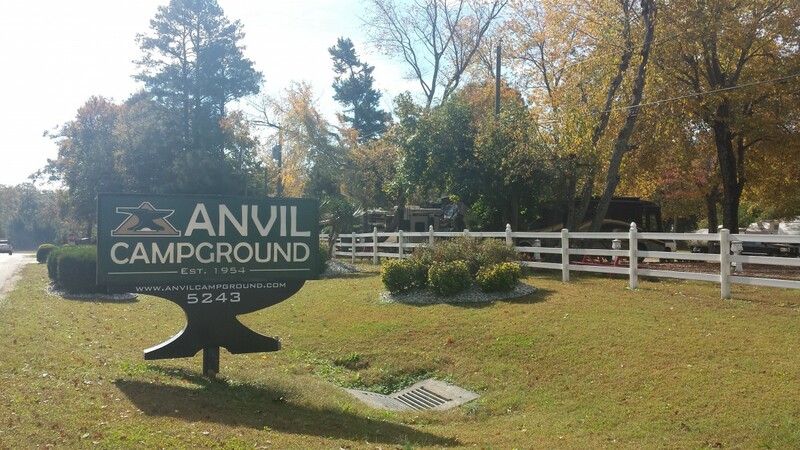 Best of all, the staff at Anvil Campground were enormously gracious and helpful. They welcomed us to the Southeast with our first “y’all” and lots of information, including great places for trick-or-treating. We felt at home. From our Williamsburg campsite, we ventured to Colonial Williamsburg a few times, to a couple of neighborhoods for Halloween and we traveled to Jamestown Settlement less than ten miles from downtown. 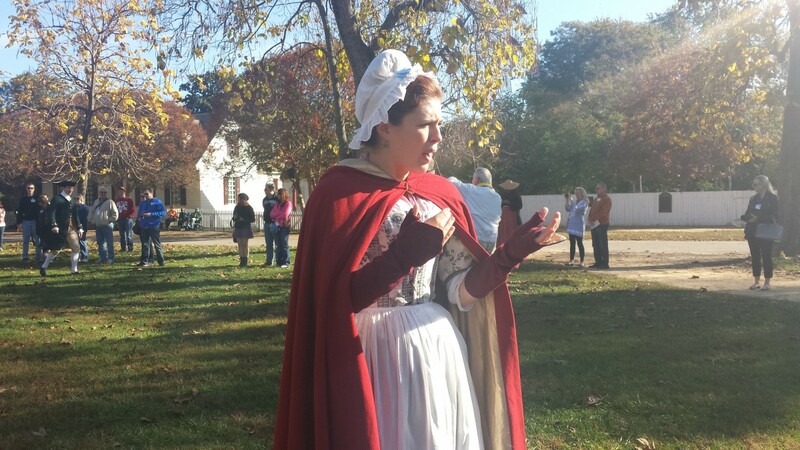 There were some things missing from our visit, though, most importantly the topic of slavery in Colonial Williamsburg. I assumed that discussing the enslavement of Africans and their descendants would be right in my face and available for unpacking, along with many other facets of colonial life. I expected it and looked forward to it. Although it is mentioned in various locations — websites, museum timelines and so on — it seemed generally lacking in presentation. I learned through volunteers in a few colonial sites that slavery isn’t really discussed in Colonial Williamsburg, because it happened “forty years later.” In other words, Colonial Williamsburg is mostly about the colonists, the origins of democracy and patriotism a la America. 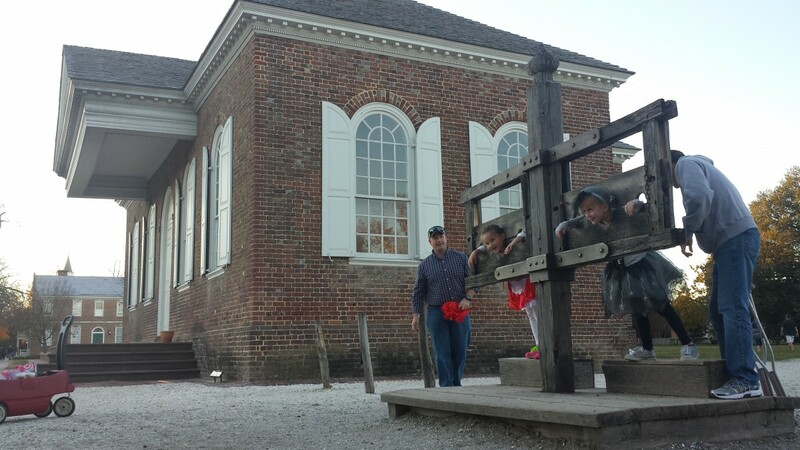 The practice of slavery in America is in great conflict with the founding principles Colonial Williamsburg celebrates. How do you make something so ugly desirable for others to experience when all that is really desired is a celebration of an ideology? In order to find conversations and real life narratives about all of the cultures who were a part of our American history, one must seek them. 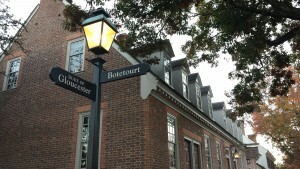 Thankfully, those venues exist, but I did not feel that they were or are portrayed in Colonial Williamsburg. We understand. America is still unpacking all this stuff. This did not necessarily spoil our adventure there. Indeed, history has its many forms and avenues, and a visit to Colonial Williamsburg is a great place to start to make history tangible and though-provoking. Although we enjoyed our time in this part of the Southeast and most definitely would like to return, Virginia wasn’t quite warm enough for us. With a strong desire to make our way to Savannah, we kept our Williamsburg visit to under ten days. We are grateful for our time there and look forward to seeing so much more that Virginia has to offer. 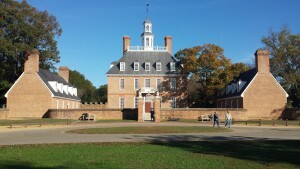 Without a doubt, if you enjoy history, visit Williamsburg, Virginia. It has something to offer everyone. 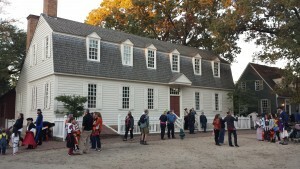 Colonial Williamsburg Home. Colonial Interpreter Next to Woman on Cell Phone. The Famous DoG — Duke of Glouchester Street, the Heart of Colonial Williamsburg. What a phenomenal experience for all of you. Williamsburg is now on my bucket list. Love how Luna’s ladybug costume is in such contrast to the other kids whom seem to be dressed on colonial garb. So glad you can appreciate the history- notwithstanding the ” glossing over of history people don’t want to discuss. If Luna can jsut grasp our foundations, perhaps she won’t let history repeat istse.f in the future.